In terms of intangibles, is there anyone in the NHL more underrated than Andrew Shaw? Although the Blackhawks boast 10 players who were selected to represent their countries in Sochi, would the Blackhawks be where they are without their 22-year-old unsung hero? While Shaw’s statistical achievements may be light, the intangibles of Andrew Shaw are attributes that are difficult to teach, or manufacture for that matter. Shaw has made his presence known since his NHL debut in 2012, fighting Dan Carcillo and notching his first career NHL goal against the Philadelphia Flyers. Much to Chicago’s delight, Shaw’s blue collared performance was a display of things to come. Since coming up an assist short of a Gordie Howe hat trick in his first game, Shaw has gone on to score 35 goals and 29 assists through 143 NHL games. Although Shaw does not possess the offensive prowess of teammates Patrick Kane and Patrick Sharp, it’s his toughness that sets him apart. 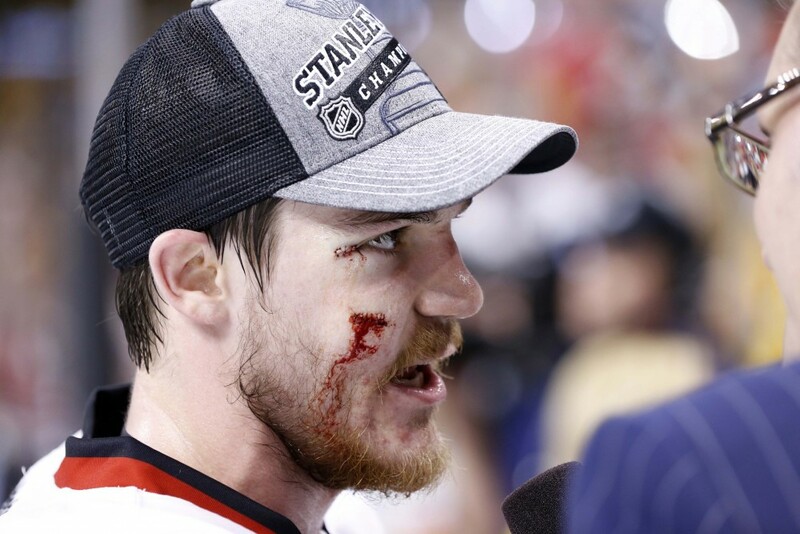 After taking a puck to the face in Game 6 of last season’s Stanley Cup Finals, Shaw earned the respect of the hockey world by returning to the game after being stitched up. While helping the Blackhawks secure their 2nd championship in four years, Shaw played and celebrated with a battle wound on his face that stood out like a third ear. His toughness, however, is not defined alone in playing through injury. Since joining the Blackhawks three seasons ago, only Brandon Bollig has spent more time in the penalty box than Shaw with the next closest teammate (Bryan Bickell) trailing Shaw’s 133 penalty minutes by 48 minutes. The Blackhawks have counted on and thrived on Shaw’s toughness. The player who describes himself as “ratty” has adopted a reputation in the league, as well as various media outlets, as an agitator who can actually play. Andrew Shaw wears a black bracelet with the writing, Ironworkers Local 721, as a reminder of his roots. The tribute to a local labor union accurately depicts Shaw’s working man’s mentality. “He always supports me, so I wanted to support him because growing up in a small town, not a lot of people make it out and I’m representing them and my family,” Shaw said of his best friend, Shannon Kirby. It’s Shaw’s work ethic, which was described by head coach Joel Quenneville as a “key attribute,” that not only landed the undersized Shaw in the NHL, but rewarded him with a new 2-year-deal worth $4 million as well. “Andrew has proven his ability to play a a prominent role on our team, and we look forward to watching him continue to grow as a player,” said Blackhawks GM Stan Bowman. While no one will mistake Shaw for the type of player that teammate Patrick Kane is, Shaw’s rise to relevancy after going undrafted for two straight seasons is unmistakably the result of sweat and struggle. Despite only being able to legally drink alcohol for a year and a half now, Shaw is already battle tested. In only his third season in the NHL, the Belleville, Ontario native has seen some things – most notably, what it takes to win a Stanley Cup. With such a small sample size in years in the league, Shaw overwhelmingly makes up for that with what he’s been a part of to this point. If Shaw can stay healthy, he is on pace to become even more of a commodity than he already is. With playoff experience and the tutelage of some of the games best players and head coach, Andrew Shaw is no doubt developing into a player that already makes his $2 million-a-year cap hit an absolute bargain – even if he only has two points in his last 10 games. After all, intangibles aren’t necessarily measured on the stat sheet.